Edible gardening generally brings to mind beds of lettuce, cucumbers, tomatoes, melons, and other foods with origins in distant continents. As natives of often vastly different climates and growing conditions, many of these plants require a lot of time and attention to bring to a successful harvest here in New England. On the other hand, indigenous New England plants (pre-dating European settlement of the USA), have evolved to grow right here in our mostly-acidic soils and changeable seasons, and if sited appropriately, can be a lower-maintenance option for homeowners hoping to diversify their diet and grow more of their own food. 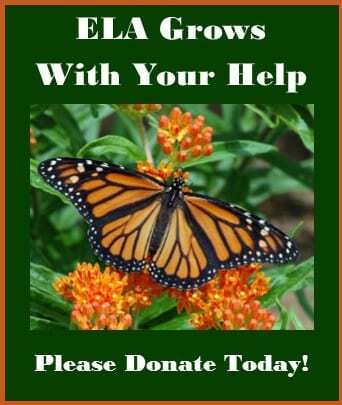 If you’re lucky enough to own even a quarter acre of land or more in New England, you may find many of the native plants described here already growing. And, in a rapidly destabilizing world and economy, it’s worth identifying them and protecting them (from the mower or deer that might devour them first, or from invasive plants that might crowd them out). Many of the native plants mentioned here are still fairly common in the wild, although increasing development, the spread of exotic invasive plants, and expanding interest in wild foraging is putting real pressure on wild populations. Home cultivation of these native plants for edible usage is a sustainable way for property owners to increase their self-reliance, help maintain existing wild populations of valuable plants and the genetic resilience they hold, as well as support the vast array of wildlife that depend on the presence of native plants for their own survival. This familiar spring-blooming New England shrub thrives among sand dunes, but as long as you have well-drained soil and a sunny area, you can grow beach plum just about anywhere. The fragrant, white, spring flowers feed hungry bumble bees, and the fruits (which ripen in late August and early September) make a nice tart jelly. Birds love to nest in beach plum, and its foliage (as a member of the Prunus family) is important food for the caterpillars of many butterfly species, so beach plum is a wonderful multi-purpose tree. Like many plums, the trees are not self-pollinating, so you need to plant at least two for fruit production. Zones 4-8. Use beach plums to make a tart jelly. Photo: Russ Cohen. 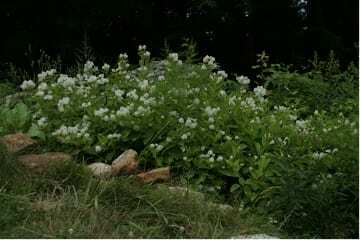 A common flowering shrub of wetlands, elderberry blooms in white frothy clusters in early summer, providing important nectar for native bees and beneficial predatory insects. Some people make syrup, beverages, and fritters utilizing Elderberry blossoms. Pollinated flowers turn into sugary, edible berries that birds also enjoy eating. You don’t need to live in wetlands to grow elderberry, but it does best in a moisture-retentive soil in mostly sun. A rejuvenation pruning every five to eight years will keep elderberry productive for many years. Cut one-third of the oldest, thickest stems to the ground each year for three years. Elderberry stems are critical habitat for the iridescent Elderberry Borer beetle. Zones 3-9. Elderberry blossoms can be used in syrup or beverages, and processed berries have a sweet flavor just perfect for wine. Photos by Ellen Sousa/THBFarm.com. 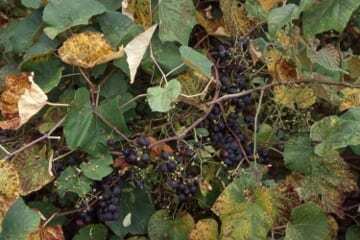 A native wild vine, fox grape is related to many cultivars of grapes grown in the US, including the Concord grape that Ephraim Bull cultivated for agricultural use in the early 1800s. The fruits ripen in early to mid-September, and then give off a great grape aroma, which helps in their detection. They are quite tart when raw, but excellent for making jelly or juice. Earlier in the season (June), the fully-grown but still tender leaves can be gathered and utilized in stuffed grape leaves recipes. To grow for grape cultivation, provide support or a trellis. Train vines over a grape arbor to create late-summer shade in a garden area. Zones 4-8. Preserve the fruit of the fox grape as a tart jam or jelly. Photo: Russ Cohen. 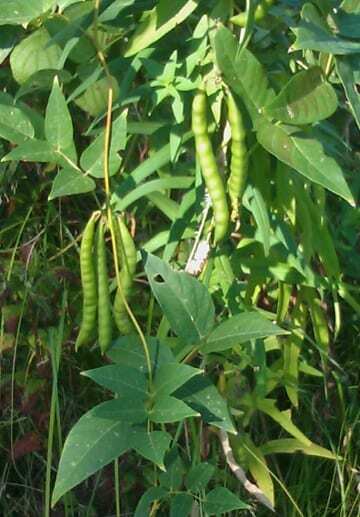 A twining vine common to wild areas (often seen growing up and around other plants), both the beans and underground tubers of groundnut are edible. Interesting fragrant, reddish-brown, pea-like flowers produced in late summer are a reminder that this plant is in the bean family. Able to fix its own nitrogen, groundnut seems capable of growing almost anywhere. Tubers (swollen roots like peanuts) were a staple survival food for Native Americans and early colonists. To grow for food production, look for improved cultivars now available in the trade, and allow plants to grow for at least two to three years before beginning to harvest the tubers. According to Thoreau, who harvested them at Walden Pond, groundnuts taste better ‘boiled than roasted’. Zones 4-8. Both the beans and the peanut-like tubers of the groundnut are edible. Photo: Russ Cohen. Hickories are important “mast” trees, large trees that provide edible nuts and many other resources for people and wildlife. Of New England’s native hickories, Shagbark (Carya ovata) produces the largest and tastiest nuts, with a flavor similar to walnuts dipped in maple syrup. The nuts typically ripen from mid-September through the first week of October. Shagbark hickory has interesting peeling bark that make it a worthwhile ornamental landscape tree for winter interest. An adaptable large tree (70’+), it will grow just about anywhere except a very dry spot. Zone 4-9. 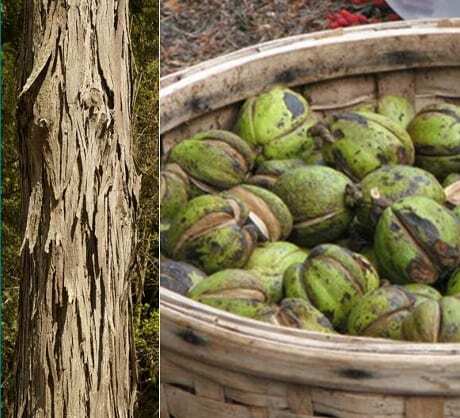 Shagbark hickory’s distinctive bark offers landscape value while the tasty nuts provide food for people and wildlife. Photo used by permission: Ellen Sousa/THBFarm.com. The most common and easy to grow hickory in central MA, Pignut hickory grows on rich woodland slopes along with oaks and yellow birch. Pignuts are not as tasty as shagbark, hence its name; colonists considered them worthy to feed only livestock. Zones 4-9. Indian cucumber is a small, dainty, woodland lily sought by some for its roots, which taste like starchy cucumbers or jicama. Although the species is often encountered in open woods growing with beech, birch, and maple, harvesting roots can kill the plant, so home propagation from tubers is encouraged in order to protect this species. Indian cucumber is very difficult to propagate from seed. Instead, plant individual tubers in the spring in rich woodland-type soil and harvest only the main rhizome during the first fall. Secondary rhizomes can be harvested in the fall of the second year. A favorite of deer and voles, plants may need wire cages to protect them. Less than 20 inches tall, this diminutive plant has pretty, yellow, down-facing flowers in spring and dark, fleshy berries in fall that feed migrating birds. Propagate Indian cucumber at home in a woodland garden for its tasty tubers. Photo: Russ Cohen. A small shrub, New Jersey Tea is well-suited for lean, well-drained acidic soil in full sun. White blooms in early summer are a pollinator magnet, and it is one of the best native plants for supporting a huge variety of beneficial insect species. This species is one of the native plants American colonists turned to for brewing tea while boycotting British tea during the Revolutionary War. Maintain a neat shape with a hard winter pruning every five years or so. Zones 4-9. New Jersey Tea stays a manageable height (2’–3′) and thrives in full sun and lean soil without irrigation or fertilizing required. Photo used by permission: Ellen Sousa/THBFarm.com. For homeowners looking for a single tree to plant for current and future value, a native oak should be at the top of the list. Quick to grow when young, if well-sited, an oak tree will be loved and admired by your grandchildren’s children. Easy to grow from acorns pushed into the soil, an oak grown from local seed will very quickly begin to support a huge variety of co-evolved native herbivorous and predatory insects – essential food for many woodland bird species. Acorns are edible by people, too, although the tannic acid needs to be leached out (typically by boiling in repeated changes of water) to render them palatable. The so-called “soft” Oak species (White oak and other species with rounded-lobed leaves) tend to have lower levels of tannic acid, which means they need less processing. The leached acorns can be ground up into a meal or flour and then used to make distinctively-flavored muffins, breads, and other baked goods. Oaks begin producing acorn crops at about age 20, and older trees can produce thousands of acorns in a year. Douglas Tallamy’s Bringing Nature Home describes the Oak as the host plant for over 500 species of lepidoptera caterpillar, making a single oak tree better than any manmade bird feeding station for supporting wild birds. The leaf-enriched soil under oak trees is also ideal for cultivating other native woodland edibles that grow best in this fungally-rich environment, including nannyberry and hobblebush. Oak species grow in a range of conditions from zones 3-9. 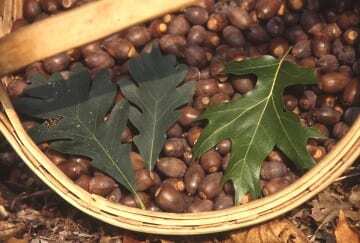 Acorns from oak trees with round-lobed leaves have lower levels of tannic acid making them easier to process into flour or meal suitable for baking. Photo: Russ Cohen. Spicebush is perfect for a woodland edge that receives morning (eastern) sun. Soft yellow flowers in April light up the barren early-spring landscape and attract early season pollinating insects with their spicy fragrance. Spicebush is dioecious (plants are either male or female), and only the females produce berries. 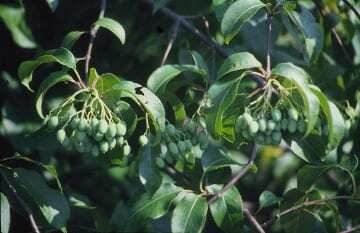 Because plants are rarely sexed, plant at least three for cross-pollination and berry production. 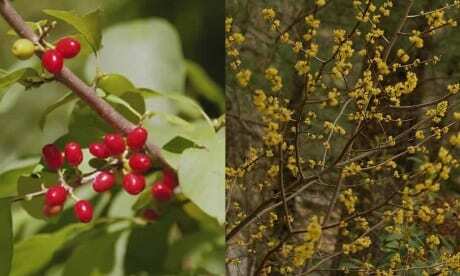 While Spicebush berries can be dried and used as a savory, peppery seasoning, they are also very high in the lipids (fats) that provide fuel to migrating songbirds. Make sure to leave plenty of berries on the plants so the birds get their share. 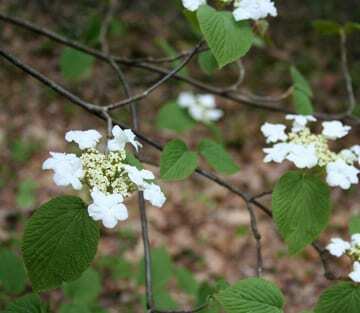 Carolyn Summers’ book Designing Gardens with Flora of the Northeast cites a study showing the fat percentages of eastern native berries and Spicebush ranked third with 33.2% fat (compared to Gray Dogwood at 39.9% (p. 24). Spicebush is one of just two host plants used by the stunning Spicebush swallowtail caterpillars. Sassafras is the other. Zones 4-9. The dry fruit of the female spicebush produces a peppery seasoning for humans, but also a high-fat food source for migrating birds. Photo used by permission: Ellen Sousa/THBFarm.com. 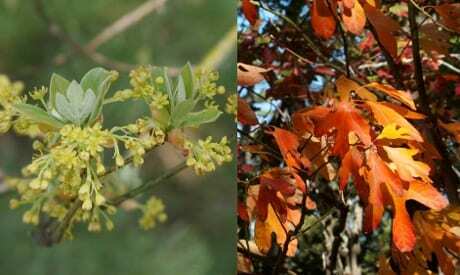 Sassafras is an attractive shrub/small tree providing spring nectar and pollen along with fall fruits. The fiery fall color on attractive, tri-lobed- leaves is a plant tactic to attract the attention of migrating birds to its dark berries. 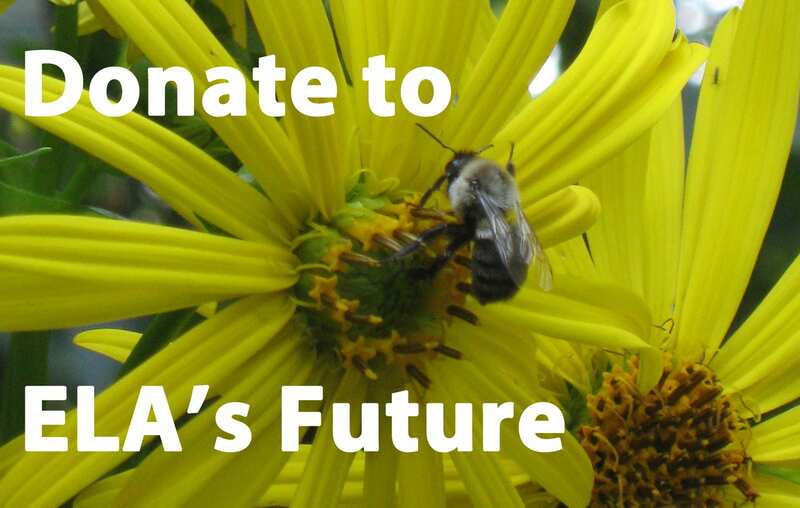 New England beekeepers value sassafras for the quality of the honey produced from it. In the wild, sassafras grows in moist areas, but it can tolerate drier soils too and is a good choice for a woodland edge or naturalized thicket. While the bark of sassafras roots has a familiar “root beer” aroma that has a long history of usage as a flavoring for drinks, confections, and medicines, the Food and Drug Administration warns that an essential oil in the root bark (Safrole) might be carcinogenic in large amounts. That said, young sassafras leaves (which have no Safrole content) are the primary ingredient in Filé powder, used to flavor and thicken soups and stews. Zones 4-9. Nectar rich Sassafras flowers attract a variety of bees and other pollinators. Photo used by permission: Ellen Sousa/THBFarm.com. A pioneer shrub, Staghorn sumac seeds itself into abandoned fields and disturbed roadsides. Staghorn sumac is quick-growing and can be effectively used as an island in a lawn for screening and bird habitat, but take into account its eventual height (25′). This is not a good long-term option for an area close to structures. Fall foliage is a beautiful orangey-red, and the large red fruit clusters persist well into winter, providing winter color and a valuable food source for overwintering birds. These same berry clusters can make a tasty, Pink Lemonade-like drink. Merely knead the clusters in cold water for several minutes, strain through a cheesecloth or paper towel, and then sweeten to taste. Zones 3-8. Sumac is a good choice for an “island” like this one in Spencer, MA. Photo used by permission: Ellen Sousa/THBFarm.com. Native viburnums grow in a wide range of habitats across New England, and their beautiful fall berries (which transform from pink to blue to purple) contrast with attractive fall foliage, making them a highly ornamental addition to any style landscape. Viburnums produce abundant edible berries that are valuable food for autumn/winter birds and their foliage is essential food for many butterflies and moths, including the spectacular cecropia moth and the day-flying hummingbird clearwing moth. Viburnums are mostly multi-stemmed shrubs that rarely need pruning if they are allowed to form their natural shape. Viburnum flowers are not self-fertile, which means that unless the wild species of your particular Viburnum is growing nearby, you need to plant several of the same variety (either two different cultivars, or one named cultivar and one ‘species’) for optimal berry production. Note on Viburnums: An invasive foreign insect called the Viburnum Leaf Beetle (VLB) has been ravaging native Viburnum along the east coast in the last few decades. Where present, the VLB skeletonizes viburnum leaves and weakens or kills wild and cultivated plants, and the outlook is bleak for the future of our native ViburnumThe Viburnum varieties listed below appear to be less susceptible to VLB damage than other native Viburnum such as Arrowwood (V. dentata) and American Cranberrybush (V. trilobum) and are still worth planting. Wild Raisin is an outstanding landscape shrub with glossy leaves that turn a beautiful burnished color in fall, providing high contrast with clusters of colorful berries that begin pink, then turn blue, and finally shrive into raisin-like fruits with edible (albeit thin) pulp. White flowers in late spring attract many pollinators. 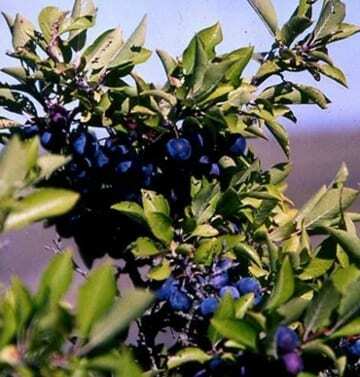 Wild Raisin grows in most soils with adequate moisture in sun or light shade. In New England, full sun produces the most berries and best fall color. Perfect for a woodland edge or a “songbird hedge” to support migrating birds on their long journeys north and south. Zones 3-9. The earliest flowering of native viburnums, Hobblebush’s showy white blooms are easily recognized in the woods of early spring (April in central MA). The edible fruit starts out green, turns red, eventually blackens when ripe, and has the consistency of stewed prunes with a bit of clove-like, spicy flavor. Hobblebush prefers damp woodland soil and protection from the hot summer sun. 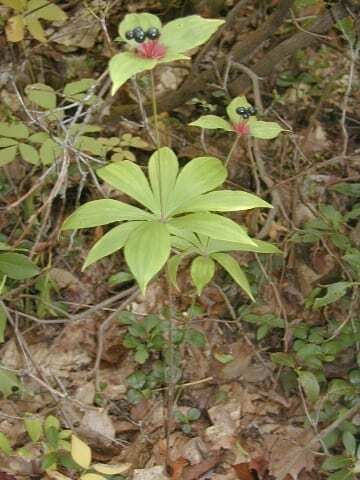 Grow hobblebush with Indian Cucumber (see below) to start an edible understory around maple trees. Zones 4-6. Hobblebush blooms in the April woods at Buck Hill Conservation Area, Spencer, MA. Photo used by permission: Ellen Sousa/THBFarm.com. 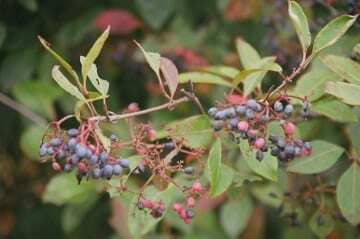 A multi-stemmed suckering shrub, Nannyberry is loaded with clusters of drooping berries in the fall that are small but tasty. Nannyberry is a little more tolerant of dry soils than its cousins the Hobblebush and Wild Raisin. Nice small landscaping tree reaching 15 to 20′ at maturity. Zones 3-7. Nannyberry produces tasty fruit. Photo: Russ Cohen. 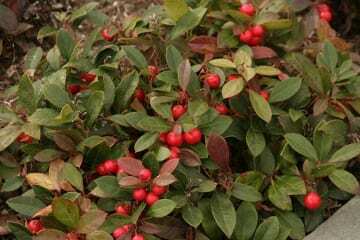 Wintergreen is a low evergreen plant with showy (and edible) red berries that persist through winter. Wintergreen is most at home growing on the cool forest floor, where it spreads loosely by rhizomes. But, given rich soil and at least half a day of sun, it can be encouraged to grow into a thick, ground-covering mat. An excellent container plant for a patio homestead food and medicine garden. Wintergreen provided the flavoring of the original Wint-o-green Lifesavers (introduced in 1918). A nice, slow-brewed tea can be made by placing a handful of tender wintergreen leaves in a clear jar filled with water and leaving the jar out in the sun for a day or two. Zones 2-8. Bright red winterberries provide striking color during the winter months. Photo used by permission: Ellen Sousa/THBFarm.com. 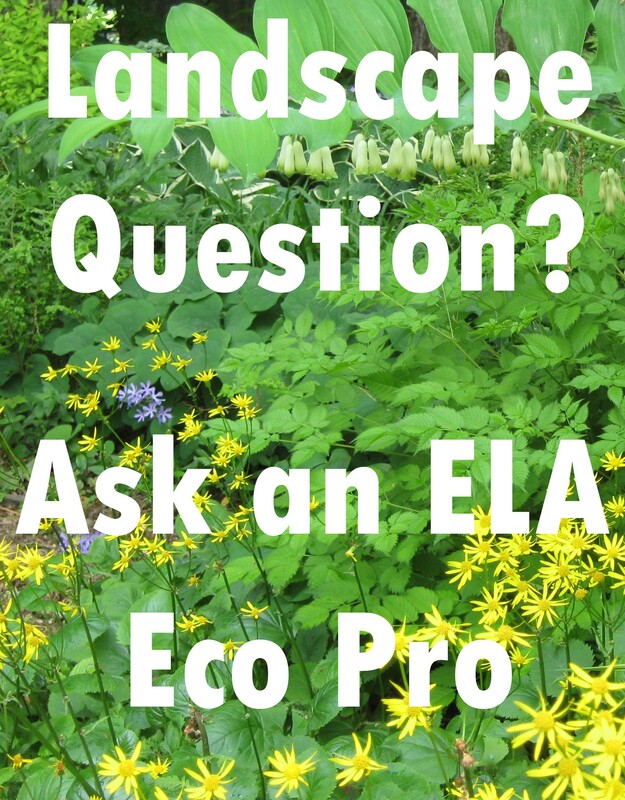 Ellen Walther Sousa, author of The Green Garden: A New England Guide to Planting and Maintaining the Eco-Friendly Habitat Garden, is a central Massachusetts garden coach who helps local gardeners build, maintain, and nurture safe, healthy, and beautiful landscapes. 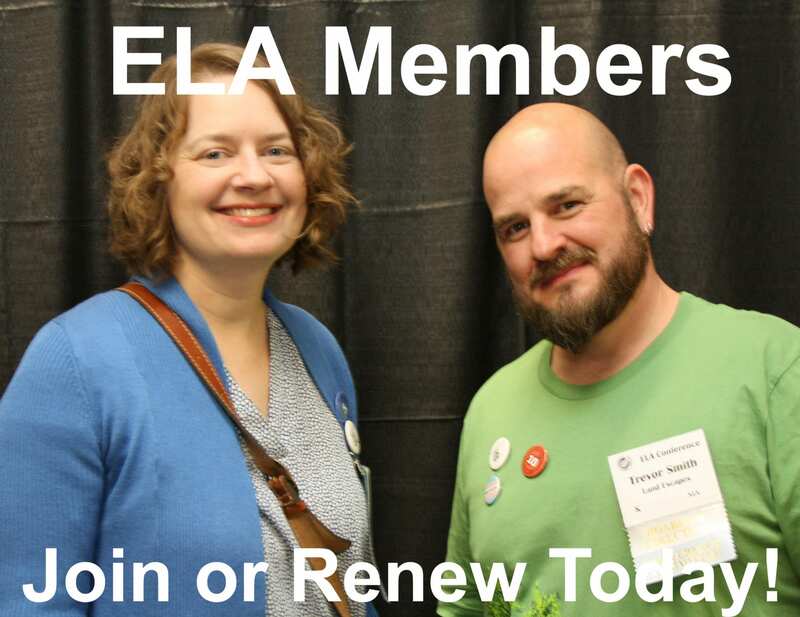 Ellen writes and teaches classes in earth-friendly gardening with an emphasis on native eastern plants. She lives on a small farm in Spencer, MA, called Turkey Hill Brook Farm, landscaped for wildlife, farm animals, and people. Tour the farm online at THBFarm.com. Russ Cohen, environmentalist and wild foods enthusiast, enjoys nibbling on and promoting the planting of edible native species. He is the author of Wild Plants I Have Known…and Eaten (Essex County Greenbelt Association, 2004) and has written a chapter on edible natives for Brooklyn Botanic Garden’s A Native Plants Reader. Russ has taught edible wild plant and mushroom courses throughout New England for 40 years. He also serves as the Rivers Advocate for the Division of Ecological Restoration of the Massachusetts Department of Fish and Game.